Everyone bowls first if they win the toss in a test in New Zealand, but should they? It seems to be established wisdom that bowling first in New Zealand is the right thing to do, but I’m interested to see if the numbers play that out. The first thing that people would want to look at is the results. I’ve first of all limited to the last 5 years, because that’s the period in which teams have always chosen to bowl first. While the team bowling first has won 33% more often than the team, that’s only 2 out of 21 matches difference. We know that if we had a perfectly fair three sided coin (hard to imagine, but go with me) and we flipped it 21 times, it would actually be very unlikely for it to land exactly 7 times on each side. (Just under 4% probability). 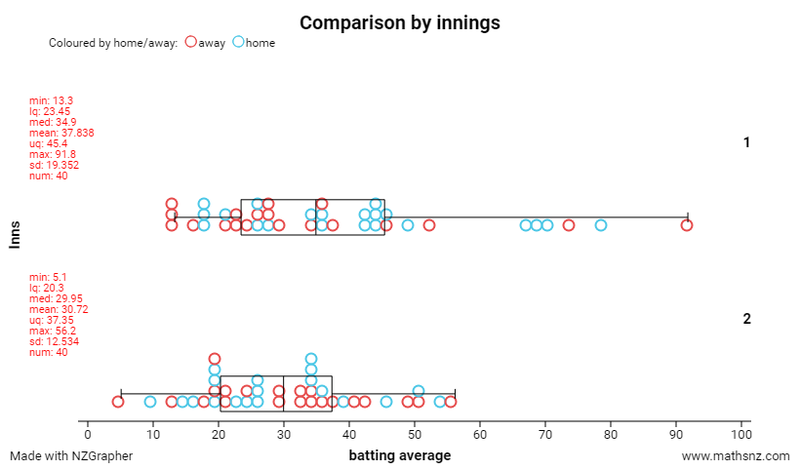 Given the data that we have, and assuming that it tells the story about all pitches in New Zealand, we can say that if you bowl first, the probability of winning is likely to be between 17.3% and 58.9%, while the probability of losing is between 9.3% and 47.9%. These are massive confidence intervals, and there’s no way that we can make a call statistically from them. 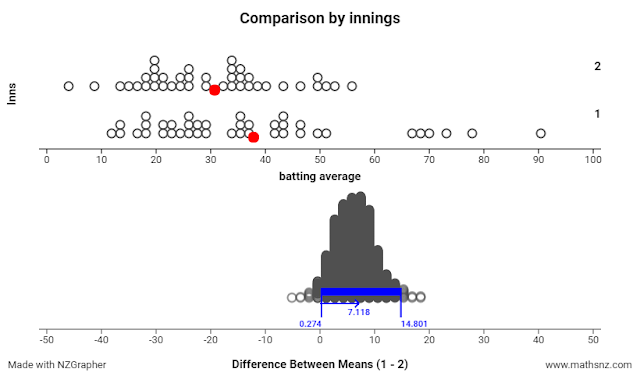 We would need to see more than a difference of two before we could statistically say that there is a difference in the expected result based if you batted or bowled first. So perhaps the issue is the small sample size. I could extend to all tests in the last 40 years in New Zealand. The difference in the experimental probability is 0.021, but the margin of error is much larger. We would need to have a difference of about 0.114 before we could say that there’s a difference statistically. At this point it’s pretty clear that winning or losing is not decided by the toss. Teams who have lost the toss and been sent in have won 28 as opposed to losing 29. We need to look deeper if we’re going to find anything. I decided to look at what the normal score was in the first and second innings. If bowling first was the right move, then we’d expect the second innings to be more productive than the first. It seems that it’s more the other way round. I’ve looked at batting average for the innings rather than score to account for declarations. (540/6 should be worth more than 550 all out). In the first innings, we’d expect teams to get about 350 and in the second we’d expect them to get about 300. Interestingly, there’s actually a statistical difference here. We can say that teams tend to score more in the first innings than in the second innings. This suggests that all the hype that says that teams should always bowl first in New Zealand is just that: hype. There’s no statistical evidence that says that bowling first is better than batting first, and – strangely – there is some that suggests batting first actually might be better.